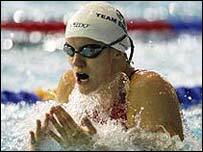 Talented swimmer Kate Haywood has landed the 2003 BBC Young Sport Personality of the Year title. The 16-year-old was thrust into the spotlight when she became the youngest ever swimmer to represent England at the 2002 Commonwealth Games. Kate, who received the award from England rugby hero Jonny Wilkinson, helped her country to bronze in the 4x100m medley relay and also came seventh in the individual 50m breaststroke and sixth in the 100m race. This year the Lincoln Vulcans swimmer proved she was top of her class after clinching gold in the 50m breaststroke at European Junior Championships. Kate, who becomes the third person to win the title following Amy Spencer and Wayne Rooney, beat Welsh motorcyclist Chaz Davies and athlete Joey Duck to land the coveted crown. Chaz competed in this year's 250cc GP World Championship, where he finsihed 14th overall. The 16-year-old became the youngest Grand Prix entrant in 2002 and the youngest winner of a British championship race in 2001. Joey, at just 14, is one of British athletics' bright young hopes. She is ranked number one in Europe in her age group in the 200m and ranked first in the UK for 100m. The time of 11.79 seconds she recently recorded for the 100m placed her second in the UK all-time under-15 list. In This SectionWilkinson stunned at awardRedgrave voted golden greatBBC defends Campese roleBBC Sports Personality round-upWilkinson scoops BBC awardRugby stars win team awardWoodward named top coachNavratilova given lifetime honourArmstrong picks up overseas titleHaywood makes a splashNobby named unsung heroEngland football heroes honouredWatson's epic fightbackQ&A: Sir Steven RedgraveQ&A: Steve DavisQ&A: Robin CousinsQ&A: Virginia WadeQ&A: Sir Henry CooperQ&A: Sir Chris ChatawayWilkinson: England's perfect 10Redgrave: Britain's golden greatWoodward warns World Cup starsBruno makes welcome returnRadcliffe eyes Olympic marathonJane raises bar againWinners pick their favouritesAnd the loser is...Did you know?